Must the United States Fight China? Might China and the United States retrace the path taken by Athens and Sparta as they destroyed the glory that was Greece? Will the two great powers of our era fall into what political scientist Graham Allison, head of Harvard University’s Belfer Center for Science and International Affairs, calls the “Thucydides trap” – the pressures that arise when an upstart threatens to overtake a hegemon? Updating what he wrote in Financial Times on August 21, 2012, Allison spoke to the U.S. Senate Armed Services Committee on April 14, 2015, and again quoted the historian Thucydides: “It was the rise of Athens and the fear that this instilled in Sparta that made the [Peloponnesian] war inevitable.” A similar “trap” has often recurred, according to Allison: “In twelve of sixteen cases in the past 500 years when a rising power challenged a ruling power, the outcome was war.” Since war was avoided in four cases, hegemonic war is not inevitable. But since China is rising and the United States declining, Allison concludes, Americans face a “chronic condition” that must be managed. All these issues are complicated and give rise to diverse interpretations. Is anything in politics “inevitable”? What kind of evidence is needed to show that most struggles between hegemons and challengers have ended or must end in war? Surely the answers depend heavily on definitions and whether the analysis focuses on underlying factors, intermediate causes, or trigging events. In what sense or senses is China outpacing the United States? Does a “Thucydides trap” exist? The classic history by Thucydides The Peloponnesian War gives much ground to question whether the competition between Athens and Sparta needed to result in war. If there was a trap, both sides blundered into it by decisions that could have been handled differently. Each side acted in ways that inflamed existing suspicions. Thus, when Athens built a wall to protect the city and its port, this raised Spartan anxieties that Athens, strong at sea, could neutralize the land forces of Sparta. The situation resembled fears in Moscow that U.S. President Ronald Reagan’s “strategic defense initiative” could eviscerate the Soviet Union’s deterrent. That issue still festers, but has not led to war. Americans and Soviets kept talking, whereas on several critical occasions Athens and Sparta broke off their discourse and recalled their negotiators. Leaving aside the more than two millennia since the Peloponnesian war, let us look at some of potential hegemonic wars of more recent times. · The late nineteenth century saw the United States wax as the British empire plateaued and began to wane. Still, Washington and London chose to negotiate their differences and, in time, cooperate. · World War I did not begin because Germany challenged Great Britain but because three decrepit empires struggled in the Balkans. Britain did not automatically fight with France and Russia but entered the war after Germany violated Belgian neutrality. · World War II started due to Japanese and German beliefs in their racial superiority and lust for fuel, food and land. Had rationality prevailed in Tokyo and Berlin, neither would have declared war on powerful states across the world. · China challenged Soviet hegemony in the 1960s-1970s but the rising and declining Communist giants fought only some border skirmishes. Nuclear weapons made war almost unthinkable. · The USSR challenged the West but the Cold War ended with a whimper. The victors did not plant salt on the ruins of Communism but sought to bring defeated foes into the comity of nations. · Commanding officers share responsibility for their units’ actions with political officers responsible for “political” work. · Beijing claims that “China is a major maritime as well as land country,” but the PLA’s force structure and leadership continue to be dominated by the Army. · The PLA has too many non-combat headquarters that share tasks and powers with local civilian authorities. · The PLA faces the challenge of units in all services being equipped with multiple generations of weapons and systems. Unless these and other difficulties are overcome, the PLA would encounter major difficulties if it had to fight against an advanced enemy. The ultimate problem, of course, is that even a small war could escalate, risking Armageddon for all parties. What about China’s economic prowess? It is manifested in the new Asian infrastructure bank organized by Beijng. Even U.S. allies such as Great Britain rushed to join the bank, over Washington’s objections. But quantity is not quality. China’s gross domestic product may come to match or exceed America’s. Still, per capita wealth in in most Western countries and in Washington’s Asian allies will probably remain for decades many times higher than in China. Indeed, many Chinese institutions as well as individuals count on Americans to keep their investments safe and to buy Chinese products. As for growth and well being, every facet of China’s power is undermined by water shortages and pollution far more serious than those in the United States. Having started from a low base using untapped resources, China’s economic growth cannot be extrapolated. Just as Germany and Japan made great strides as they rose from the ashes of World War II, so it is natural that China would become rich and powerful after discarding Maoism. China’s students excel in math, but the country’s capacity to innovate is stifled by top-down controls. No Chinese working in China has won a Nobel prize in science. The several Chinese who have received Nobels in peace and literature are defamed in China. The country dispatches many of its best and brightest to study in the United States, even though few return. All parties need to cool their anxieties and their rhetoric. Meanwhile, as Allison’s colleague Joseph Nye argues, the United States continues to lead the world in most dimensions of soft as well as hard power. America’s ability to mobilize these assets with smart power, however, is uncertain. The United States squanders vast human and material resources at home and abroad. Allison is right to quote Pogo: “We have met the enemy and it is us.” For example, there is no valid reason why the Beijing airport should outclass any counterpart in the United States. Neither complacency nor a knee-jerk reaction to China’s rise is appropriate. Yes, Thucydides reminds us that hegemonic challenges are dangerous. The sinologist and former Australian prime minister Kevin Rudd cautions that “a new concert of power would seem to require more cooperation and even constitutional change than China or the United States is ready to accept.” There are hotheads and hawks in both counries. But if American and Chinese leaders are prudent, they will identify and collaborate on complementary interests: clean energy, reliable food and water supplies, and better health care systems. Both face security threats in Northeast and South Asia. Each needs to cooperate for arms control and against terrorism. 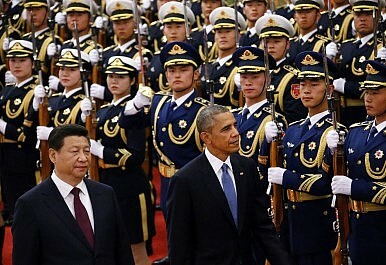 Neither Washington nor Beijing should act on the self-fulfilling expectation that conflict between them is inevitable. Each can help their own and other countries to develop in harmony. Walter Clemens is Professor Emeritus of Political Science, Boston University, and Associate, Harvard University Davis Center for Russian and Eurasian Studies. He wrote Complexity Science and World Affairs (SUNY Press, 2013).